Just wanna share the pic of our cake on 26.02.2011. It's melting peeps! I was sooo sad. 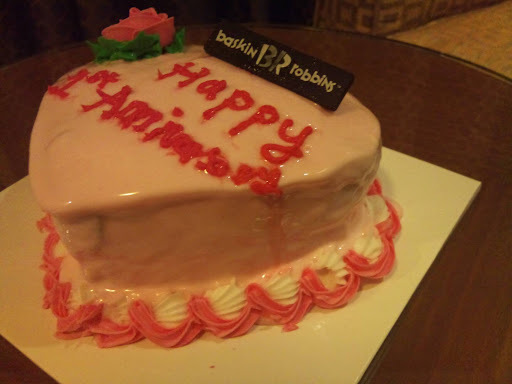 I hate baskin robbins! Full stop. Nana: fridge tak ckp sejuk..sbb die ice cream kan..then mini fridge kt hotel xckp sejuk so it melts.sedeyy tauu..
Affe: babe,xselera nk mkn sbb dh cair.lastny x abes punn..masuk trash bin.lg la sedeyy..xley nk simpan coz lame2 die cair trs..sobsob..